If you’re looking to buy a Refrigerator then you are in the right place to find the best refrigerator sale, including coupons & promo codes from major retailers. Browse the current discounts & promotions for Whirlpool, LG, Samsung, KitchenAid, GE Appliances, Maytag, Frigidaire or Bosch refrigerators. Whether you’re looking for a basic refrigerator or a high-end model, you’ll find great deals here. Find amazing sales and use printable coupons for refrigerators, to pay the lowest price on your new refrigerator. – Save up to 25% OFF on appliances. Exclusions apply. Minimum savings is 5%. – Receive 2 Google Home Mini devices with select LG appliances. – Receive $150–$500 back from Samsung with appliance package. Offer ends 5/16/18. Exclusions, terms and conditions apply. – Receive 10% or 12% back from Bosch with appliance package. Offer ends 6/30/18. Terms and conditions apply. – Free $100 or $200 gift card with Samsung appliance package. Upgrade your kitchen or laundry room with four or more qualifying Samsung major appliances totaling $4,000 or more and get a Best Buy gift card. – Save up to 30% OFF Appliance Special Values. Exclusions apply. Offer ends 5/16/18. Free Next-Day Local Delivery. – 10% OFF eligible purchases every day to active military personnel and veterans. 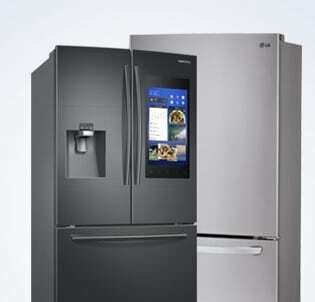 – Save up to $500 via Rebate with minimum spend on Select Samsung Appliances. – $245 OFF LG 24.1-cu ft French Door Refrigerator with Dual Ice Maker. – Save up to 20% OFF on Select Freezer & Ice Maker Special Values. – Save $250 – Your Choice: Black or White Whirlpool 20.5-cu ft Top-Freezer Refrigerator. – 10% OFF Your Lowe’s Advantage Card Purchase. Get 10% OFF your eligible purchase or order charged to your Lowe’s Advantage Card between 5/11/18 and 5/12/18. – Save up to 25% OFF on Select Appliances. Valid: 4/26 – 5/16/2018. – 6 months financing on purchases of $250 up to $999. – Save 40% – $1197.90 LG Electronics 21.8 cu. ft. French Door Refrigerator in Stainless Steel. – 29% OFF Kenmore 73042 25.6 cu.ft. French Door Refrigerator + Free shipping. – 33% OFF Kenmore 73045 25.6 cu.ft. French Door Refrigerator + Free shipping. – 40% OFF or More Kenmore & Samsung Refrigerators + Free Delivery Over $399. – Get 10% Cashback in points on featured Samsung Appliances. Offer valid until 5/19/18. – Save up to 30% OFF on Appliances plus Extra 5% OFF with Sears Card or 12 Months Financing or Free Delivery. – Save $1000 on Kenmore Elite 24.1 cu. ft. Bottom-Freezer Refrigerator – Stainless Steel, $1099.99. – Save $2000 on Kenmore Elite 28.5 cu. ft. French Door Bottom Freezer Refrigerator w/ Grab-N-Go Door – Fingerprint Resistant Stainless Steel, $1999.99. – $20 off $150 Storewide at Sears. Promo Code: 9700084000542278. Includes Clearance. Excludes TVs and Levi’s. Not Valid on Lands’ End, Giftcards, or Sears PartsDirect Items. Excludes License Business and Sears Optical. Valid In-Store and Online. – $10 off $100 Storewide at Sears. Promo Code: 9700084000824572. Includes Clearance. Excludes TVs and Levi’s. Not Valid on Lands’ End, Giftcards, or Sears PartsDirect Items. Valid In-Store and Online. – Up to 30% OFF Kenmore Appliances + Extra $50 OFF $499 + Free Delivery on $399. Use Promo Code: KENMORE50. Valid 02/02/19. – Up to 40% OFF – Kenmore Memorial Day preview. – Save 20% OFF on Compact Refrigerators. No Promo Code Required. – Save 31% OFF on Kenmore 60505 18 cu. ft. Top-Freezer Refrigerator with Glass Shelves – Stainless Steel, $599.99. – Save 33% OFF on Kenmore 41173 25 cu. ft. Side-by-Side Refrigerator – Stainless Steel, $899.99. – $5 OFF $50 Storewide. Use Promo Code: Promo Code: 9700083956162950. Excludes Clearance and TVs. Valid In-Store and Online. Ends: May 31, 2018. – Save up to Up to 30% OFF Major Home Appliances. Free delivery on orders $399+. – Save up to $500 on Select Samsung Home Appliance Packages. Receive up to $500 Costco Cash Card. Valid until 5/16/18. – Save up to $800 OFF on Select LG And Samsung Appliances for Members. – Save $700 on Whirlpool 27CuFt 36-inch Wide 3-Door French Door Refrigerator in Stainless Steel. Online only offer. – Save $999 OFF for SRP Maytag MFT2976AEM 28.6 CuFt Ice2O Series Stainless Steel 3 Door French Door Refrigerator. – $1498 OFF SRP Frigidaire Stainless Steel Kitchen Package with French Door Refrigerator. – Save $519 OFF SRP Whirlpool WRF989SDAM-SS 28.6 CuFt French Door Refrigerator.